Much more than just an office building, the Petronas Twin Towers sparked a nation’s pride and came to symbolize Malaysia’s jaunt into the 21st century. Join Editor Chad Merchant and step back in time to explore the history and construction of these magnificient towers. Perhaps as meaningful to Kuala Lumpur as the Eiffel Tower is to Paris and the Statue of Liberty is to New York, the iconic, soaring Petronas Towers are unquestionably the symbol of modern Malaysia. Hard though it is to believe, this year will mark an astonishing 23 years since construction began on a project that would not only transform a city’s skyline, but also the heart of a nation. It’s hard to overstate the importance of the part the Petronas Towers have played in KL’s continuing evolution into a world-class city. Back in 1991, the Sears Tower was the world’s tallest building, nobody had mobile phones, the DVD hadn’t been invented, and the Internet wasn’t even a glint in the eyes of the world’s computer techies, who were instead excited about the upcoming release of a brave new operating system called Windows 3.1. And in the heart of Malaysia’s capital city stood a 40-hectare site that had once been occupied by the Selangor Turf Club. Local authorities had decided to reclaim the land in a bid to help ease the growing traffic in KL, but in the end, this left a tract of land in the heart of the city that, to put it frankly, was worth millions. So what better way to put this valuable land to good use than putting a really tall building on it? Putting two really tall buildings on it. To represent Malaysia’s increasing wealth and the nation’s desire to feature more prominently on the international stage, it was decided to build a pair of landmark 88-storey towers to house the offices of the national oil and gas company, Petronas. The decision was also made to use reinforced concrete for the superstructure, rather than the more conventional steel framework found in most skyscrapers. The rationale was that Malaysia had far more workers experienced in concrete construction methods and the material was locally available. Importing the vast amounts of steel that the Petronas Towers would have required looked to be far more expensive, as well. So though a concrete skeleton was roughly half the cost of steel, it was also twice the weight. Excavation started in March 1993 after developers shifted the whole site 60 metres southeast of where it was initially designed to be. Drilling had shown bedrock irregularities at that site that would have made supporting the immense weight of the buildings an almost insurmountable challenge. So with a newly fixed site a quick stroll away, a massive foundation was excavated, its 21-metre depth easily capable of swallowing a five-storey building. During the height of excavation work, some 500 truckloads of earth were removed every night. To support one skyscraper with a weight of 300,000 metric tonnes is surely an impressive engineering feat, but to pour a foundation that can handle two such towers required not only a wealth of structural engineering savvy, but also the largest and longest continuous concrete pour in Malaysian history – and this is a country which builds almost everything from reinforced concrete. Each tower required an immense foundation comprising a forest of deep piles driven into the bedrock; once 104 concrete piles for each tower were bored into the earth, a 4.6-metre-thick concrete raft was poured around them. For a staggering 54 hours, concrete was poured non-stop into the foundation raft, a truckload arriving every 2.5 minutes, like clockwork. From the beginning of excavation to the completion of the massive foundation took one full year. Now, at last, the towers could begin their ascent. In the original plans, principal architect César Pelli had the towers topping out at 427 metres, which fell only 15 metres shy of tying the world’s then-tallest building, Chicago’s Sears Tower. 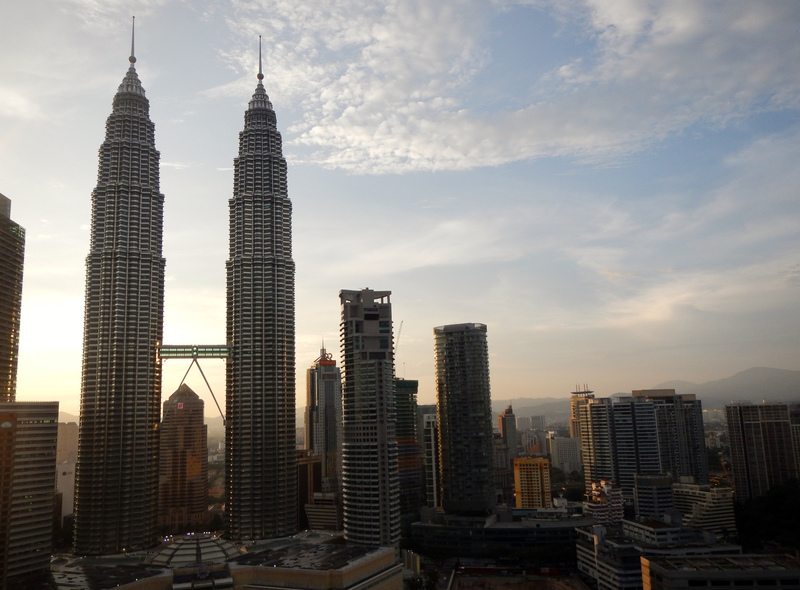 Once Malaysia’s prime minister learned how close it was, he pressed the architects and engineers to find a way to make the towers taller, so that the world’s tallest buildings would be in Malaysia. And though designers didn’t add any floors to the structure, they still found a way to push the height to over 450 metres, wresting the crown from the United States for the first time since the construction of New York’s Empire State Building in 1931. In yet another unorthodox decision, each tower’s construction was handed over to a different contractor, and indeed, two different nations. Japan-based Hazama Corporation led the consortium for Tower One, and South Korean titan Samsung Engineering and Construction led the build team for Tower Two plus the Skybridge, the unique two-level structure that would connect the two buildings at roughly their midpoints. Thousands of Malaysian and foreign workers were hired for the twin towers’ two construction teams… and the race was on! There was definitely a sense of competition to see which team could build out their tower first, but also whose would be deemed best. In the end, the question of which tower was the best may have been a draw, but there’s no question who won on speed. Even though the South Korean team had not only a tower, but also the Skybridge, and even started construction a month after the Japanese team, the Koreans finished first, about a week before their rivals. An unmistakable highlight of the twin towers is the Skybridge, which connects the two buildings at their 41st and 42nd floors. The structure is the world’s highest two-storey bridge and spans a distance of 58 metres. A complex system of hinges, expansion joints, and spherical bearings ensures that the Skybridge stays firmly in place regardless of how the two individual towers may independently move or twist. Lifting the prefabricated Skybridge into its final place was a particularly demanding task, so a specialised engineering firm was brought in solely to manage the feat of hoisting the 450-tonne assembly – including the 325-tonne main structure as well as the support legs and other equipment – over 170 metres above the ground. The nine-step process took over a year to test and plan, and two weeks to actually perform, but in the end, was executed flawlessly. Finally, the time came to set the crowns atop these twin monoliths: the gleaming 73.5-metre tall stainless steel pinnacles, which had been redesigned to bring the building’s official height to 451.9 metres above street level. The pinnacles, which comprise a mast, a spire ball, and a ring ball, were lifted piece by piece and fixed into place almost a month to the day after the towers had both been declared as fully topped-out. A month after that, the Council of Tall Buildings and Urban Habitats, the world’s arbiter for such things, declared Malaysia’s sparkling new Petronas Towers the world’s tallest. The nation’s vision had been recognized and 37 months of determination and tireless, round-the-clock hard work by thousands of Malaysians and hundreds of foreigners paid off in a shining, soaring symbol of a country poised and eager to ride the crests of its favour and fortune headlong into the new century. The Petronas Towers’ claim as the world’s tallest buildings, alas, was not to last long. In 2004, Taipei 101 took the top spot, and its reign was almost equally short-lived as it ceded the crown to Dubai’s Burj Khalifa in 2010. Interestingly, by the time Malaysia discovers whether or not it will achieve its stated goals in the year 2020, it is predicted that the Petronas Towers won’t even be in the top ten tallest buildings, so fast are construction techniques advancing. In fact, the expectation is that the Twin Towers, once the tallest in the world, will rank at 27th place by 2020. Skyscrapers soar ever higher, and cities continue to pin their hopes on that distinctive super-building that will define and energise both their skyline and their citizens. 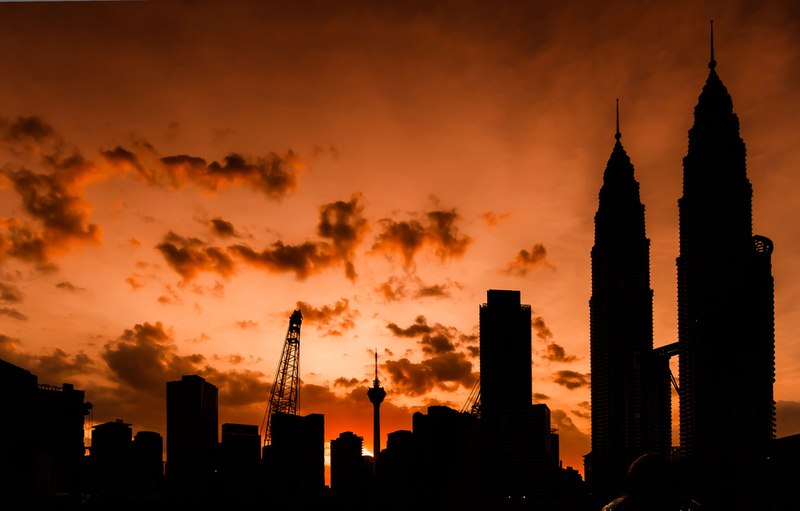 But seldom before has a building – or in this case, a pair of them – come to showcase an entire nation’s aspirations and capabilities as profoundly as have these twin towers, a shining testament to a Malaysia that is truly ascending. March 1993 -Excavation work begins. 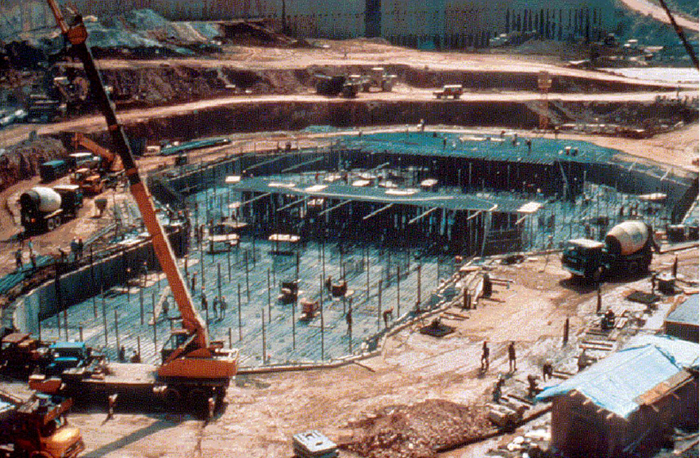 March 1994 -Excavation and foundation for Tower One complete; construction begins. April 1994 -Excavation and foundation for Tower Two complete; construction begins. May 1995 -Pre-assembled Skybridge arrives from South Korea. August 1995 -Skybridge is lifted into place. February 1996 -Topping-out of both towers is completed. March 1996 -Installation of pinnacles for both towers. April 1996 -Petronas Towers officially declared the world’s tallest buildings.